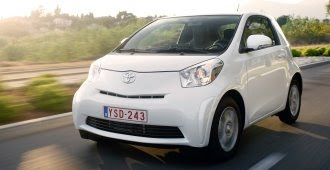 The UK’s mainstream car mags have been let loose on real roads with some pre-production examples of the innovative Toyota iQ – the upcoming 3+1-seater city car. Their verdicts may disappoint those hoping the pint-sized box-on-wheels might deliver a unique combination of quality, capability and frugality when it arrives in the UK in January. Auto Express cheekily describes its driving opportunity as “exclusive”, and then proceeds to spout 500 words of factoids from the press release that have almost nothing to do with how the car feels from the driving seat. In the last couple of paragraphs the mag finally manages to note that the driving experience “could be sharper”, that the car is slow but “firm and planted, with safe and predictable handling”, and that it’s “nippy and fun” and “better to drive than a Smart”. Overall Auto Express gives the car a broad thumbs-up, although given the lazy reporting we’re not sure that this opinion counts for much. At least Autocar’s report gives the impression that someone has actually driven the thing. Autocar says the iQ is “impressively refined” and “very stable even at higher motorway speeds ... unaffected by passing lorries”, which is good to hear given the light weight, slab sides, and shortish wheelbase. Autocar is very happy with the 1.3 litre petrol engine plus “clean shifting” CVT gearbox, labelling it an impressive combination offering “surprisingly muscular performance”. The tight turning circle is also singled out for praise. Negatives? The wide B-pillar and small rear side window mean that “the over-shoulder view is poor”. The ride also seems a bit rough, according to Autocar, and the brakes feel lifeless. 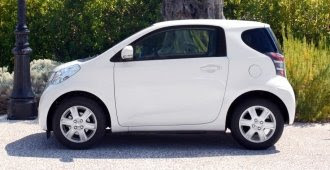 Overall, Autocar suspects Toyota hasn’t done enough to make the iQ feel like a premium product, predicting that it will have a tough time prising customers out of their ordinary superminis, given its likely price premium. Car Magazine, meanwhile, sampled the smaller 1.0-litre engine and it sounds as if this is a spec to avoid, the weedy three-pot leaving the road tester “finger-tapping, disappointed by the lack of oomph” up hills. Like Autocar, Car thought the 3.9m turning circle “brilliant” and “a real boon” around town. The “organ-wrenching body roll” on fast corners was not quite so welcome, though. And while Autocar liked the CVT gearbox, Car finds it “dismal” and as welcome as a dose of the plague. The manual alternative, meanwhile, offers “incredibly long” gearing sufficient to reach 60mph in second. What conclusions can we draw from these contradictory impressions? Well, the iQ clearly won’t drive like a sports car, but it should feel safe. It will need to be keenly priced to compete with Minis above and Fiat 500s below. The unusual interior layout works, but the overall impression isn’t quite the posh-car-boil-washed that Toyota promised. And the CVT gearbox probably needs the bigger engine. We’re a tad disappointed by the consensus, but will wait our own first test drive to really make up our minds.